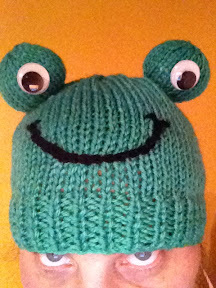 This was designed for Kim, as she wanted a cute hat, and the colour green. Cut yarn with 30 cm remaining. 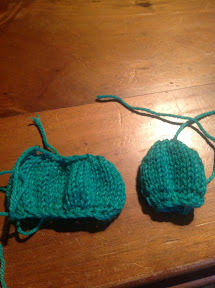 Slip stitches onto cut off yarn, pull to tighten. Sew up the back. Cut yarn, slip stitches onto yarn. Pull to tighten. This is the top of the eye. Stitch up side. Stuff. Attach to hat. Stitch on a smile on the froggy.